AMAZING LATE AVAILABILITY DEALS ON FEW REMAINING DATES IN APRIL-JULY 2019, FROM JUST £2600! Do you know somebody looking to get hitched in Spring/Summer 2019, or perhaps someone looking for a cost effective wedding for prices that won't break the bank? Glenmore House is offering exclusive deals on our last few remaining weekend dates in 2019 at unbelievable prices that are even lower than our already highly-competitive rates! Fully inclusive late availability packages are now being offered from just £2600 for 65 people! Don't believe it? Email us for more information at [email protected] and see for yourself! SINCE 1921, we have been welcoming discerning guests to this romantic venue of contrasts, rich in history and character. Built in 1840, Glenmore House is a fine example of late Georgian architecture situated in the exclusive Surbiton conservation area adjacent to Claremont Gardens; a landscaped park providing the perfect backdrop for wedding photographs. Impressive double gates open on to Glenmore’s free, private car park which can safely accommodate up to 110 cars. Every wedding we host is unique and our experienced, dedicated Wedding Co-ordinators ensure that your special day is one that you will remember forever. Glenmore House is licenced for civil ceremonies and can accommodate wedding parties from 25 to 140 guests. Recently refurbished, all our rooms complement each other perfectly. Our light and airy Tudor Rooms offer an ideal setting for your wedding ceremony with elegant 16th century reclaimed cathedral glass windows adding to the sense of occasion. Our fabulous Elizabethan Suite comprises of a magnificent double height ballroom featuring sparkling chandeliers, minstrel galleries and a sprung dance floor, adjoined by an exclusive, contemporary bar area. With a very competitive room hire charge of just £300 for the private use of our Elizabethan Suite and a £200 hire fee for the use of our beautiful civil ceremony room, Glenmore House represents outstanding value for money, setting us apart from the majority of extortionately priced wedding venues locally. Your choice of wedding breakfast is prepared in-house by our brigade of award-winning chefs, who can boast culinary experience in some of the UK’s finest establishments including the Fat Duck in Bray. Our delicious food is created for you using the highest quality, fresh ingredients and we have acquired an enviable reputation for gourmet cuisine second to none, offering superb value for money with no compromise on quality. Lucy & Christoph's magical day with us! With its tall arched reclaimed stained glass feature windows, and crystal chandeliers the room oozes character, which is why it is utilised for the conducting of civil marriage ceremonies. The room has high ceilings, and the advantage of an acoustic partition to divide the room in half if required. It is an ideal space for the conducting of civil marriage ceremonies, or a smaller Wedding Breakfast for up to 70 people for a sit-down meal. This fabulous bright and airy room has large bay windows overlooking Claremont Gardens. Once the master bedroom to the old house, it has been transformed into a large multifunctional space with comfort cooling and blackout curtains. The room is perect for hosting a more intimate wedding breakfast! Freya and the team at Glenmore were brilliant!! Right from the moment we enquired they did everything they could to accommodate our requests and offered us some great ideas, like adding mini mince pies to our canapés and where to put candles in the bar. Their two main rooms are very different in style and I was a little worried about this to begin with but actually they perfectly reflected the character of the building. The main Elizabethan suite is perfect for the dinner (it's so beautiful) then the bar area suites the more fun side of weddings. Their policy of returning the cost of any unopened bottles of wine was great as we had about 5 unopened in the end. The value of Glenmore House as a venue was amazing, especially as the quality of service was never compromised and the food was brilliant. Our guests absolutely loved the food and I know they kept the bar staff busy, but no drink was too hard to accommodate. The staff were always friendly and on the day went out of their way to ensure my husband and I were well looked after. We had our own tray of canapés and personalised desserts!! With our 5th December wedding, Glenmore was perfect as we didn't really need any outdoor space – however Claremont Gardens opposite worked our great for our main photos. DJ John (recommended by Glenmore) - was great and accommodated almost all our requests (we had 60 as opposed to 40!). We didn't have to worry about any music during the reception. He gave us a CD at the end with all our tracks which we've been continuously playing since. This was so lovely! So to sum Glenmore House weddings can be everything you want and still be affordable! Thank you to Freya and her team for our amazing wedding reception! Location is superb with many guests using Surbiton train station to get home or staying in one of the many hotels in Surbiton (leaving cars in secure car park at Glenmore). Food is also amazing - many of our guests said how tasty the dishes served were! The service delivered to us on the evening by Freya was absolutely outstanding and made it an evening which we both shall never forget. Thank you! Our daughter Lucy ( and Stewart ) held their wedding reception at Glenmore House on 26th July 2014 , I have to say it was a fantastic choice because everything from the quality of the food to the high level of service was simply outstanding , Freya and her team worked so hard and paid attention to ever piece of detail that was asked for ....the facilities of Glenmore House are terrific , the DJ John was also excellent….in conclusion ..if you are holding or thinking about using Glenmore House for your wedding reception ...I can 100% recommend this venue ....simply the best !! What can be said about Glenmore House? Back in the Summer 2012 I stumbled across Glenmore House on the Internet. I never then would have believed I could of so easily found the hidden gem that Glenmore House proved to be. We could never have dreamed that we could have found such a beautiful venue but that we did. My husband and I were Faye’s first official booking and we couldn't have asked for a more attentive, helpful and supportive wedding coordinator. Faye was always at the end of a phone answering any question or offering advice and was the support network every bride dreams of having. The food was amazing, which made our food tasting a little challenging, but enjoyed by all our guests on the day. The bar was well stocked, well-staffed and very reasonably priced and a welcome contrast to the stunning Elizabethan Suite which was the perfect room for our wedding breakfast and evening reception. The waiting staff, chefs and coordinators done the most amazing job all day ensuring that everyone was happy and well looked after. We have received nothing but praise for such a wonderful day and venue from our guests and we highly recommend this beautiful venue. Can't wait to book again for another special anniversary. Just had our Daughter’s wedding here, absolutely amazing venue, with fantastic staff. Nothing was too much trouble. The wedding organisers, Freya & Faye, both a credit to Glenmore House. We booked venue 18 months in advance, they answered all our questions & always replied to emails, they were a pleasure to deal with. There is No charge to hire the venue, which is great now days, and even better, the bar is normal prices, not over-inflated hotel prices. The food was delicious, & service first class. The Manager Robert & one of the chefs Barry even gave Bride, Groom & us a lift over to hotel because it was raining. We would recommend Glenmore House to anyone thinking of getting married, or looking for a venue that will certainly impress family & friends. If you have a date in mind book early so you're not disappointed. Thank you again for making a special day, even more special. The Chamberlains & The Duffins. We got married at Glenmore House a few weeks ago and we had an amazing day. The Glenmore team work so hard on many weddings and events but they always got back to us with answers to queries and accommodated site visits for my family to see the venue, which is so rare with many other venues. The value for money is absolutely brilliant, there really are no hidden extras, everything is included in the quote, which again is rare for a wedding venue of such high quality. Freya and the whole team always went above and beyond during planning and delivery of the day. We had an amazing wedding day, as did our guests. The food is so good, you get proper portions of delicious dishes. Our guests commented on how great the food was and there is a great choice of options to choose from. The Elizabethan Suite is beautiful, we had a winter wedding and hired Glenmore's candelabras which looked stunning. Freya personally oversaw every little detail of our day, which meant we could really enjoy our day. John the DJ who comes recommended by Glenmore was also fantastic, our dancefloor was packed all night with guests of all ages. We had a number of songs we wanted playing and this was no problem for John. He came and met with us a number of times and on the day itself, he was brilliant. We had the most perfect wedding day at Glenmore House and we cannot recommend the venue and team highly enough. Thank you so much to Freya and the team. Thank you to all the Glenmore House Team for your care, consideration and efficiency which combined to produce such a happy and successful celebration for our daughter jennifer and her new husband Paddy on January 19th. From setting up prior to the wedding, throughout the whole event until staggering home time - the bar prices are amazing! - and not forgetting the help, the following morning, in seraching for the lost suit jacket, another family member picked it up and returned it! every single member of the team displayed the same efficiency and courtesy at every level. No one person stood out, you all did. Further, everybody agreed that the food and wine were superb. It was a truly memorable day. Thank You Glenmore House is brilliant as are their staff. We fell in love with this venue from day one, as soon as we walked into the Elizabethan suite we had butterflies!! Freya and her team were absolutely amazing throughout the whole of our wedding experience. When it came to the big day on 8th December 2012 I had every faith that things would run smoothly and that is certainly what happened. All of our family and friends said what a lovely day it was and that the venue was perfect. The food, staff, atmosphere and general professionalism were all AMAZING. I will certainly be recommending Glenmore House as a place to celebrate whether it be a birthday, christening or wedding. Glenmore House really is the perfect wedding venue. Not only is it beautiful, with the gorgeous ceremony room and stunning Elizabethan suite, but Freya and the team made our wedding the most special stress free day we could have asked for. All the staff were all so friendly and helped everything run so smoothly. The food was delicious, beautifully presented and plenty of it! Also the crescent gardens opposite proved the perfect location for photos. Overall Glenmore House was amazing, we couldn't have asked for a more perfect wedding venue. Thankyou!!!!!! Our wedding at Glenmore House was fantastic in every respect. Freya was a calm and reassuring presence during the planning and her and her team were fantastic on the day. The venue looked stunning, the food was delicious and we and all our guests had a great time. All at a reasonable price too! Thank you so much Freya and the team at Glenmore House! Our wedding was fantastic and the venue was perfect and affordable. We've had so many compliments about how great the food, service and venue was. Having crescent gardens a stone's throw away was also great for pictures! We can't thank them enough. Mr and Mrs Lueken. Thanks for most wonderful day on August 12th at our daughter Nicola and her new husband Mark Bentleys wedding. The period leading up to the big day is often fraught with minor panics and fears, from the moment we arrived until our departure, Rob you and your colleages made the day one which we will never forget. Absolutely nothing went wrong. You were all terrific. You may like to know everyone loved the beautiful building, easy parking, central location, haven't stopped praising the dinner, and likewise the evening guests are still talking about the quality of the buffet. The bar service was without a doubt the best we have ever encountered,and we know what we are talking about here! Everyone was impressed with the prices. we have no hesitation in recommending Glenmore to anyone desiring a friendly, but extremely professional service for any occasion. Once again thank you. We got married and had our reception at Glenmore House on 25th August. We cannot recommend this venue highly enough! The staff guided us through everything in the run up to the wedding and answered every question we had - big or small! On the day everything went so smoothly, we didn't have to worry about a thing. The food is amazing here (the tasting session is wonderful - though it is difficult to pick from the wide range as everything is so yummy!) - all our guests commented on it and we only saw empty plates. The prices are also very reasonable at Glenmore House which is a big plus, but nothing is compromised at all. The sun was shining for us and we had photos in the park across from the venue, we also had a car and took a short drive to the river for some additional photos. Guests congregated outside the Elizabethan suite to enjoy the sunshine as well. The venue itself is stunning, both the ceremony room and Elizabethan suite are so grand and unlike any other venue we looked at. The bar area is very spacious and also allows you to have different music in two areas in the evening, as well as providing space for photo booths and musicians. Overall we had the most amazing day, everything was perfect and would recommend Glenmore House to everyone! We cannot thank Freya & her team at Glenmore house enough for helping to give us the wedding of our dreams! We were made to feel so welcome & special by everyone who worked at Glenmore House, the food was just outstanding for such an affordable menu, the service the staff provided was impeccable & everything request we made was met without fuss or questioning! All our guests said it was the best food & wedding they had ever experienced & that has so much to do with such a beautiful venue staffed with people who care!! It was the perfect day & we wouldn't change a thing! You made our dreams a reality and we cannot thank you enough! Finding an affordable reception venue in the London area is very difficult so when we visited Glenmore House we couldn't believe our luck. It was exactly what we were looking for and significantly cheaper than anywhere else we'd looked at. Freya was extremely helpful from our first visit and all staff on the day (and the day after) were friendly and welcoming, accommodating individual requests without fuss. When snow prevented a number of our guests attending they happily removed a table and adjusted the seating plan when we informed them on arrival at the reception. They also sorted out last minute food requests without any fuss. The wide range of wines they offer are reasonably priced and offered on a sale or return basis and the bar choice is extensive and priced lower than most pubs. Choosing our menu from the wide range of dishes available was difficult but the included tasting definitely helped! The portions are extremely generous and several people have told us it was the best food they’ve had at a wedding. We can’t thank Glenmore House staff enough for helping us hold a brilliant reception; we even got a lift to our hotel from one of the managers to top it off! We really couldn’t have dreamed of a more wonderful day than the one Glenmore House helped to provide. From the very first contact they were professional, knowledgeable, helpful, and simply couldn’t do enough to ensure the day went smoothly. We had some fairly unique requests but they took them on board and delivered the perfect day. They even managed to hold off the rain until after the photos were taken! We’d looked at quite a few alternatives but Glenmore House just ticked all our boxes for being stylish, affordable and flexible. Huge thanks to Faye and her colleagues for providing such a memorable day. My new hubby and I got married here on Saturday 21st April 2018 and had the best time ever! Our guests loved it, and the food and bar were a massive hit with everyone! Nothing was too much for Faye and her team and the day went without a hitch! They made our day amazingly special and made us feel like we were top of their priorities! Thank you so much to Faye and everyone at Glenmore for everything! You are all a credit to Glenmore House! We are beyond thrilled with the incredible job Faye and her team did with our wedding. From cocktail hour to the end of the night, they were flawless. Wedding planning can obviously be a stressful time, but Faye was an absolute gem to work with. We so appreciated her calm, upbeat attitude throughout the process, not to mention her endless patience with our hemming, hawing, and constant readjusting of details in the final weeks. Even our guests commented to us how great Faye was, and how friendly and helpful every member of the staff was throughout the night. From the welcome canapes to dinner, not to mention the ridiculously awesome spread for the evening snack, our guests were stuffed to the max with delicious food. And the venue......it's so beautifully presented and we loved having the bar area separate from the main hall as it allowed people to the freedom to boogie on down or drink and chat without shouting to be heard. My husband and I had high hopes when we picked Glenmore House as our venue, but what we got in the end far surpassed what we dreamed of (we really cannot stress enough just what an incredible deal Glenmore House is for everything that you get). When we woke up the morning after, we were ready to plan another wedding just so we could enjoy another night like that. We're pretty determined to find something else to celebrate there soon. 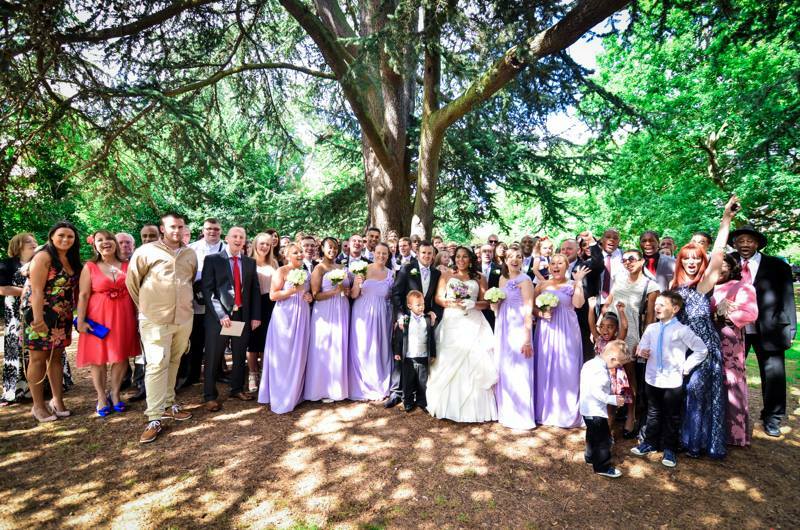 "We had an unforgettable wedding day at Glenmore House and our guests really enjoyed it. The Glenmore House team provided an excellent service in the planning stages and on the day which made things very easy for us. Glenmore House was excellent value and very flexible and accommodating in terms of being able to personalise your day." "We cannot thank our Wedding Coordinator and the team at Glenmore house enough. We had the most perfect day. Thank you for helping to give us the wedding of our dreams! From the beginning when we first booked our wedding day we were very pleased with the service we received. The food was just amazing, enjoyed by all of our guests and very affordable too. All of our family and friends said it was one of the best weddings they had ever been too. We cannot thank you all enough, you truly made our day very special." "My now husband (!) found Glenmore House when searching for wedding venues online. We wanted somewhere that looked great but that wouldn't break the bank and we were delighted to find that Glenmore House ticked all the boxes.From the moment we arrived at Glenmore House for a viewing, everyone was so friendly and welcoming and the Suite was beautiful and looked very grand, especially with the balconies and fairy lights. Our Wedding Coordinator was a great point of contact and bless her, she didn't mind the constant bombardment of emails and questions in the run up to the wedding.The choice of food was incredible and beautifully presented. All our guests commented on how great the food was and how friendly the banqueting staff were on the day. They bent over backwards to ensure we had the most magical of wedding days! We'd definitely recommend Glenmore House to anyone that is looking for a beautiful venue with stunning food and great service for their wedding day. " "Amazing day at Glenmore House - Excellent service, restaurant quality food, friendly and helpful staff, beautiful venue - we'll be back!" Also available is a Children's Menu, Vegetarian Menu and Vegan Menu. Would you like a civil ceremony on site?